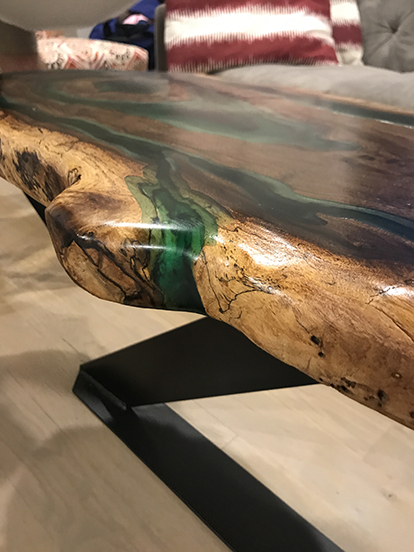 Doc Wright is the owner/craftsman of The Wright Edge, an artisan woodworking business in Dallas, Texas. From start to finish, each piece is handled only by Doc or his business partner including sourcing/cutting down, milling, and drying. He uses locally sourced, 100% regionally native wood. Edge of “Lagoon” by The Wright Edge. Full image is featured at the top of page. 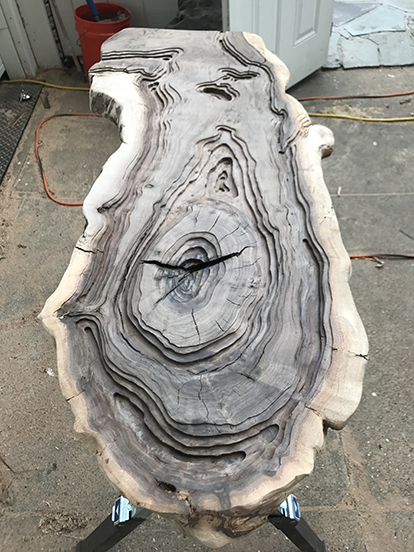 Description: Black walnut slab that was freehand routered out to give 4 layers of depth. These contours were then filled with different shades of WEST SYSTEM Epoxy colored turquoise to give it 3D depth. This piece was designed and made for Dallasites101. 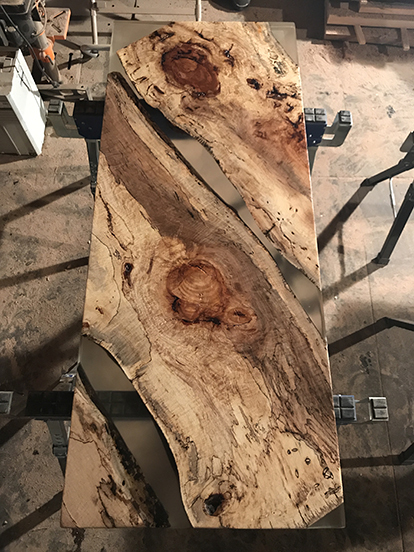 Description: Two Spalted Pecan slabs cut diagonally, then carefully encased in clear WEST SYSTEM Epoxy to flow with the grain in a diagonal direction to appear as if it’s drifting. 3 out of 4 corners are clear WEST SYSTEM Epoxy and the fourth corner is a corner piece of pecan. 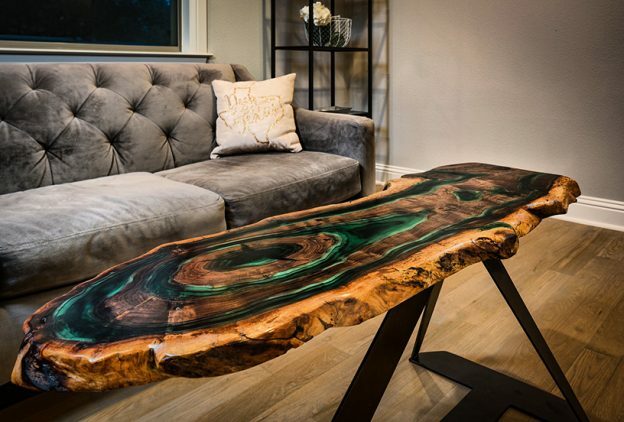 It truly has a one-of-a-kind feel. Students at IIT designed and built this baroque sculpture named The Iron Chapel. The intent of the project was for students to explore the principles of the baroque era through the use of modern materials. The primary inspiration for the chapel was the dramatic lighting created by the architecture of the period. 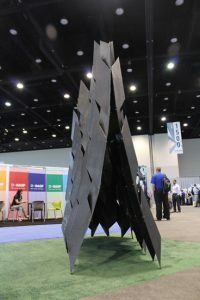 To achieve this drama in their structure the students built panels that they assembled into columns which connect at the top to create a triangular profile. The positions of the overlapping panels creates apertures that allow light to pass through the walls of the structure supplementing the light from the oculus in the above. The shifting perspective of the viewer gives the structure a life of its own. 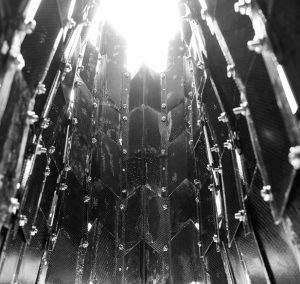 The use of carbon fiber allowed them to explore form, work with a singular material and have a lighter weight and therefore more manageable fabrication process. The Iron Chapel on display. 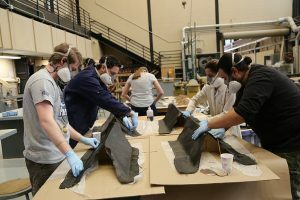 Students build the individual carbon fiber panels. 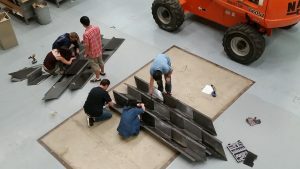 IIT students assembling the carbon fiber panels into columns. 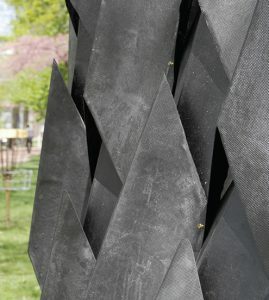 A detailed view of the overlapping carbon fiber panels. This view is from the inside of the Iron Chapel, looking up into the oculus. Bill Goddard and Keti Gibbons live in Naples, FL. 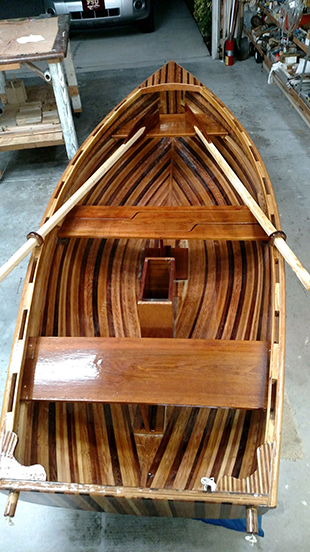 They built this 9’10” cedar strip skiff from scratch using clear red cedar and epoxy. The Gougeon Brothers shipping department was undergoing a relocation a few weeks ago. In the process of their move, Daryl decided the previous shipping transfer pallet was looking rather tired and needed to be replaced. 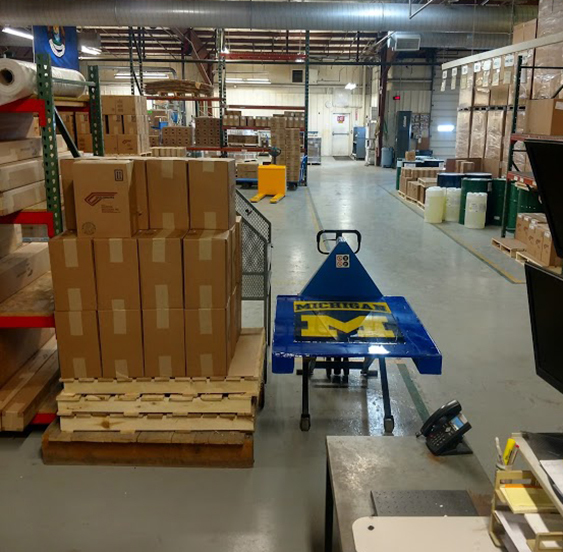 The shipping department’s only request was to incorporate the U of M logo. New shipping transfer pallet, installed and ready for action. Daryl wet out 3 layers of 737 Biaxial Fiberglass with 105/207 he tinted blue. He let that cure until tacky then added the legs constructed from scrap cardboard honeycomb core. The next day the legs were covered with fiberglass wet out with blue tinted epoxy. The third day he flipped the pallet over and created a wall around the perimeter of the top using our 883 Vacuum Bag Sealant. 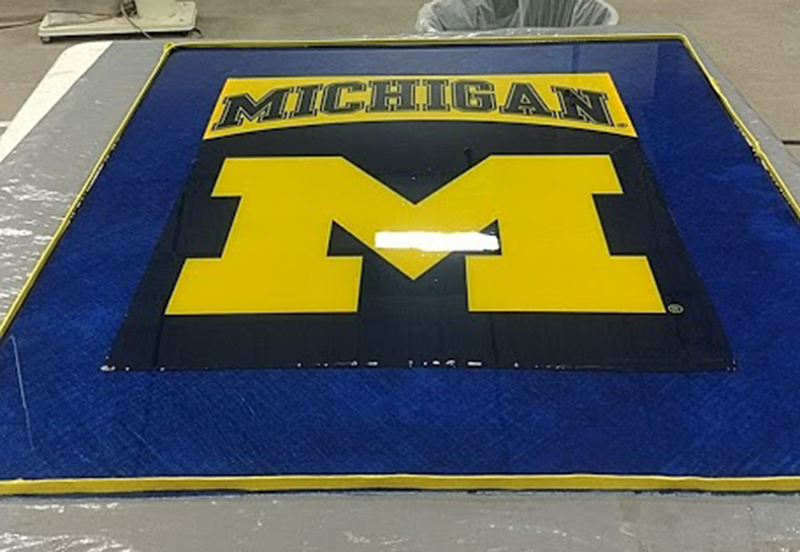 He rolled a thin layer of 105/207 onto the top and waited for it to become tacky before applying a U of M yard flag to the center of the pallet. 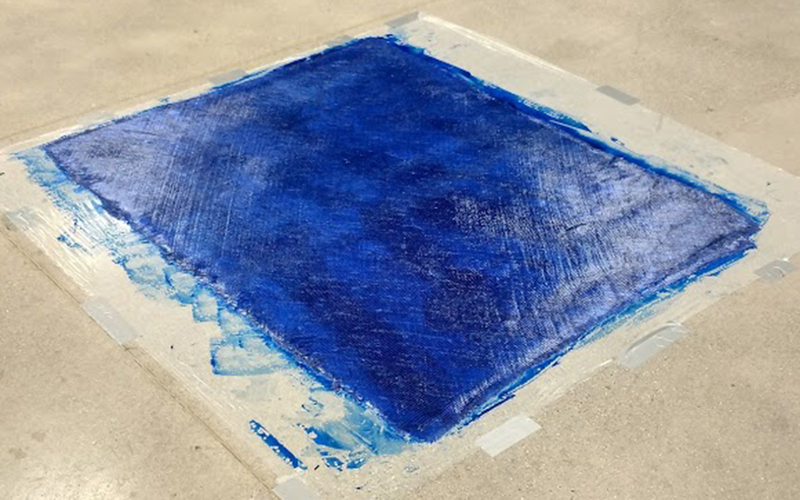 With the flag adhered to the surface so it couldn’t float, he covered the pallet top with about a 1/4″ of epoxy completely encapsulating the flag. After curing over the weekend, he removed the sealant, sanded the sharp edges and installed it in our shipping department. Vacuum Bag Sealant was a simple way to create a perimeter wall for a shallow pour. The shop floor, covered with plastic, was a great location for laying up a large flat panel.